Rashad Brown is a burgeoning 23-year-old middleweight boxing contender heading into the prime of his career. Boxers and trainers compare his look and style to a young Muhammad Ali with his lean, tall body, deft movement and smooth punching combinations. Rashad is an undefeated professional, ranked in the top fifty in his weight class, and likely harbors dreams of fighting on HBO and winning a major world title. Before you read on, watch just one-minute of Rashad (in the black shirt) boxing in this video shot at my gym in Upper Darby. 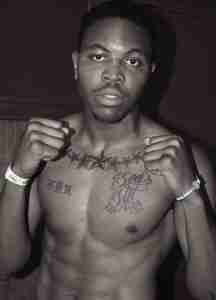 This is Rashad Brown, “The Boxer”. “I’m retired.” Those two words hit me like a jaw-rattling left hook. “What?” I offered meekly in response still shocked at what I was hearing. “I have a detached retina from my last fight.” Rashad explained. How could this be? How could a promising young man have his dreams shattered? It didn’t make sense. It still doesn’t. Rashad walked me through his pain and suffering with a smile on his face. He showed me his retina still red from the damage from his last fight. He told me that he hadn’t been in the gym in two months, since it happened. He recounted reading about “Sugar” Ray Leonard, who also retired from a detached retina, in his autobiography and how he turned to cocaine to combat the pain of not being able to do what he did best, box. Rashad doesn’t want that life. He doesn’t want this tragic circumstance to define him. When I saw him in the gym, he look like he was moving up to heavyweight, not because he was getting fat, but because he was getting stronger. He started lifting weights regularly to channel his anger and keep him in the gym. I’m glad he’s using some natural anti-depressants in the form of a dopamine release from exercise. It’s the best prescription for his ailment. I don’t know Rashad all that well. He’s been training at my gym for many years. I’ve always liked him, but I wasn’t quite sure why. Thinking about it today, I realized that despite not knowing him well, I feel a strong sense of his character every time I encounter him. His energy is always bright and positive when he greets you. You exchange only a few pleasantries with him, but when he says, “Have a good day.” he means it and your day is a little better. Polite, humble, hard-working, disciplined, honest, positive, courageous…these are just a few of the litany of complimentary adjectives I could use to describe Rashad. His character is so strong that I’ve learned all this about him without ever having a deep conversation with him. It’s just the way he carries himself. Through the crowd of ordinary passersby, Rashad stands out from the pack as “A Man of Character”. I believe that everyone in this world is constantly channeling energy through themselves and transferring it to those around them. This is the energy in the ether. The same energy that, when you burn your hand on a hot iron and then yell at the next person you see, converts the energy in the form of heat from the iron to energy in the form of pain in your hand to energy in the form of negative feelings inside the person at whom you yelled and so on as the chain reaction continues. Some people typically convert energy into positive forms and others typically convert it into negative forms. Rashad is a positive energy converter, living life with the right attitude, and infecting those around him with a sense of joy just from being in his presence. What will define Rashad Brown? Will it be the lost opportunity of a promising boxing career? I don’t think so. I don’t know if he will be Rashad Brown, “The Boxing Coach, Rashad Brown, “The Police Officer, or Rashad Brown, “The Business Owner”. Rashad has the right attitude in life. He will create the best opportunities for himself. Rashad Brown will not be defined by his craft or by his tragic circumstances. Rashad Brown will be defined by his strong character, which gives me hope in times of sadness. The remarkable thing is we have a choice every day regarding the attitude we will embrace for that day. We cannot change our past… we cannot change the fact that people will act in a certain way. We cannot change the inevitable. The only thing we can do is play on the one string we have, and that is our attitude. I am convinced that life is 10% what happens to me and 90% how I react to it.